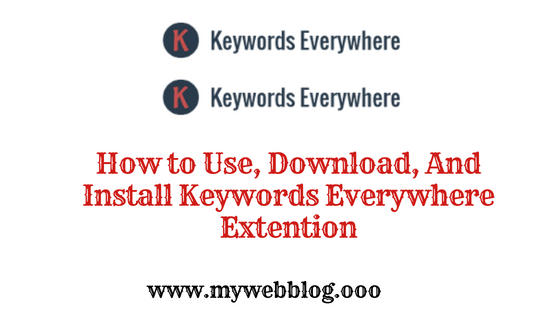 Keyword Everywhere Extension: Hello Friend's In today's article, we are going to tell you about Keyword Everywhere Extension, how to download it, how to install it, and how you can use this extension to find better keywords. Friends, we first know what the Keyword Everywhere Extension is? As the name of this extension shows that it is used to find Keyword which you can install in your Chrome browser and this extension shows you better keyword search. Now here are three important questions - 01 Do we have to find Keyword like Adword on this extension and 02 How this Extension can show us a better Keyword and 03 This Extension tells us which side of the Keyword Does the information appear? 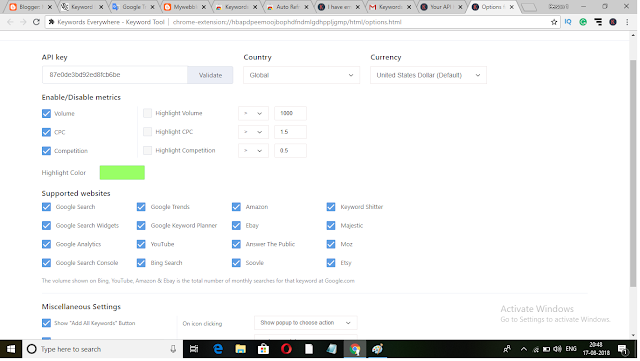 01- Do we have to search Keyword like Adword on this extension? After installing the Keyword Everywhere Extension in your Chrome browser, you just have to search your keyword and search on Google, and this extension lets you analyze information about that Keyword by analyzing all things. 02- How can this Extension show us a better keyword? We will let you know that the Algorithm of Keyword Everywhere Extension Different Keyword Analysis Tools has been made by studying. Because of this, he analyzes those tools and then gives you the Detail Information Show. For example, Google Search, Google Keyword Planner, Ebay, Keyword Shitter, Google Analytics, YouTube, Ubersuggest, Majestic, Google Search Console, Bing Search, Answer the Public, Moz, Google Trend, Amazon, Soovle, and Etsy etc. 03- What extensions of the Keyword do we see this extension? 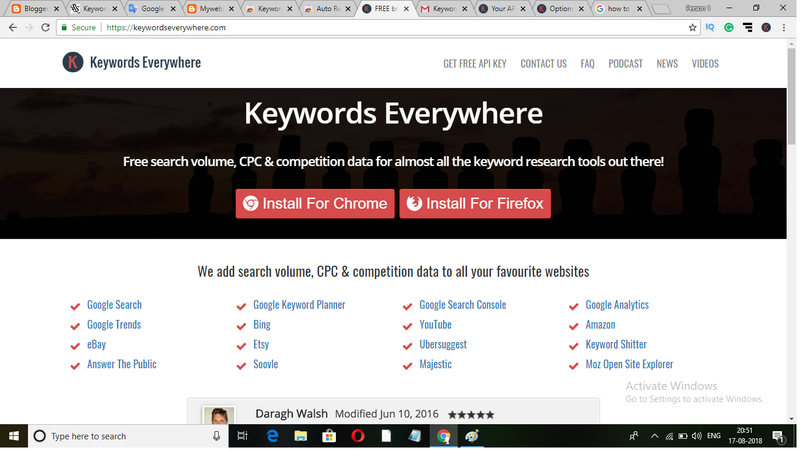 The third and most important question that shows the Keyword Everywhere Extension, we tell you that this extension gives you information about that Keyword's Volume, CPC, and Competition. By which you can understand how much traffic you can get when writing an article on that keyword and how much benefit you can get. Now that we talk about how to install the Keyword Everywhere Extension in your Google Chrome browser, first you need to do a search on Google "Keyword Everywhere", which will easily get you the Official Website of Keyword Everywhere Extension and you can open it. Once you open the website, like the image above, a website will open on your browser, where you get two options like "Install for Chrome" and "Install for Firefox", which gives you this extension on your Chrome Browser and Firefox Browser. You can use it. First, click on Install for Chrome button, now you will open a page of the Chrome Extension where you have given the option to download this extension. You can easily download Keyword Everywhere Extension by clicking on it. After Extension Download, Automatic also installs on your Chrome Browser. But this will not work, because now you have to configure this extension according to your own and enter the API key as well. For which you can follow the steps given below. Once you install Keyword Everywhere, like on the screen above, a page is opened, where you have to enter your email address, after that click on the Email Me API Key button and your API Key But it gets sent on. Now you will open an email account. You will see that an email from Akash Mansukhani may have come to you, first of all, you open the email where you have to click on the "API Key Here" button. 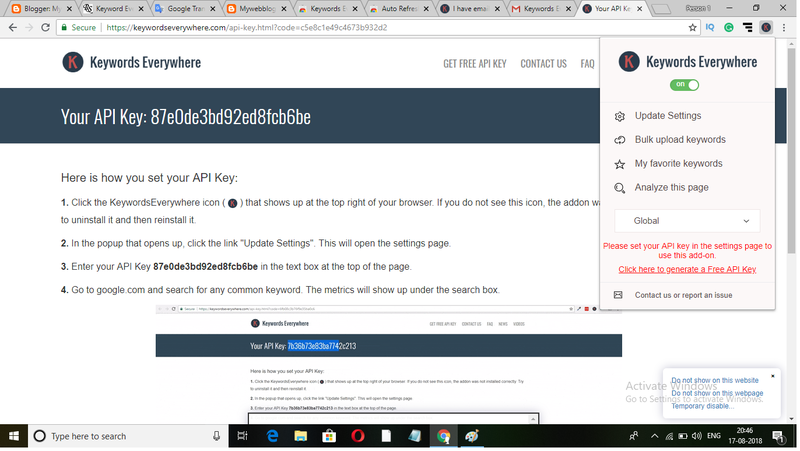 Which will open a new page in the new tab and you get your API key there. Firstly, select that API Key and copy it. Now you open a new tab and click on the symbol of (K) being displayed in the Chrome browser and a list opens in front of you. In this list, you get an option of "Update Settings", you click on it and a new page will open on your screen. 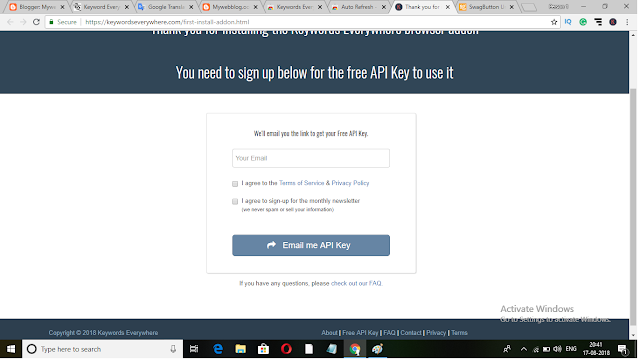 In this open page you have to enter your API Key, which you have already copied, then paste that API Key into this box and click on the Verify button. Now your Keyword Everywhere Extension is verified, in this page, you can Tick or Un-Tick the option accordingly. We will suggest that you tick all those options so that the extension can show you Result according to all those features and you can find better keyword. Keywords are very important for any blog post, so you must install Keyword Everywhere Extension in your Google Chrome browser and after you do a Keyword Research, you can do Keyword Decide for your article so that you can get better traffic. At the same time, if you have any problem in this topic or you have not understood anything properly, then please tell us in the Comment Box so that we can fix it and give you a better result. Thank you.